April 2, 2019, Saitama, Japan – Tamron Co., Ltd. (President & CEO: Shiro Ajisaka), a leading manufacturer of optics for diverse applications, announces the presentation by the Technical Image Press Association (TIPA) of its TIPA Awards 2019 to Tamron lens; 28-75mm F/2.8 Di III RXD (Model A036) for “BEST MIRRORLESS STANDARD ZOOM LENS”. Tamron has been honored with TIPA Awards for 6th consecutive years. This fast mid-range zoom for Sony E-mount cameras has specialized glass elements that control aberrations and deliver excellent resolution throughout the entire focal length range. 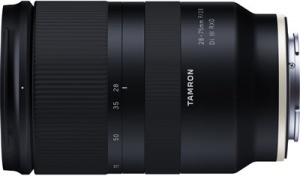 All the lens surface is treated with Tamron’s proprietary BBAR (Broad-Band Anti-Reflection) Coating that significantly reduces ghosting and flare. An all-new high-speed AF drive system with an RXD stepping drive delivers rapid, quiet focusing action. The lens features close focusing of 0.19 meters at the wide setting as well as moisture-resistant coating construction and fluorine coating, making it ideal for outdoor and nature photography. Weighing just 550g and being 117.8mm in length, it is a highly portable lens for every photographic adventure. The TIPA Awards are world-renowned as the most influential photo and imaging product awards in the industry. The Technical Image Press Association (TIPA) has a worldwide membership of photo and imaging magazines from 15 countries across five continents. Once a year the editors of TIPA’s member magazines meet to vote for the best photo and imaging products in each category.